Drinks stay cold and fresh, hands stay warm and dry with the superior triple insulation of Eco Vessel's fun to use bottle. It features a flip spout and no tilt drinking, so easy and convenient to stay hydrated, whether kids are playing sports, video games or reading. Drinks stay cold and fresh, hands stay warm and dry with the superior triple insulation of Eco Vessel&apos;s fun to use bottle. 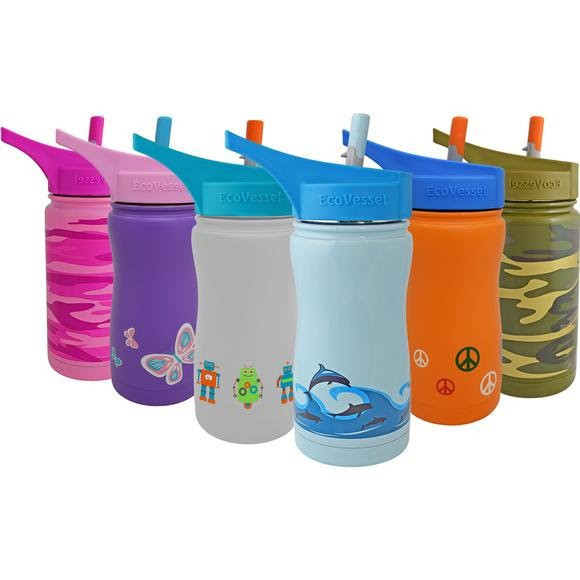 It features a flip spout and no tilt drinking, so easy and convenient to stay hydrated, whether kids are playing sports, video games or reading. Eco Vessel&apos;s vacuum TriMax triple insulation technology has been tested to keep liquids cold for 36 hours and hot up to 8 hours. NOTE: the spouts are NOT removable on these bottles. If a spout comes off, STOP using and contact Eco Vessel. Replacement tops for the kids&apos; bottles are available on their website in the &apos;Replacement Parts&apos; tab under the &apos;Shop&apos; button. If you need assistance, please contact Eco Vessel. Measurements 3" x 3" x 7.5"